As much a rebuttal as it is a biography, Tolstoy's biography of the twentieth century British novelist's life proves both unusually insightful and distractingly biased. The author's relationship to his subject is revealed up front: Tolstoy was O'Brian's stepson through a second marriage and a ""frequent correspondent with the reclusive author"" before his death in January 2000, an association that provides Tolstoy with a trove of untapped source material in the form of personal letters and family papers. More impressive, perhaps, is Tolstoy's encyclopedic knowledge of his stepfather's work, which he employs at almost every turn to demonstrate the largely autobiographical nature of O'Brian's fiction. Too often, though, Tolstoy's analysis resorts to speculation, and, given the writer's potential conflict of interest, such uncertainties are impossible to ignore. Hanging over Tolstoy's work from page one is a previous biography, Dean King's Patrick O'Brian: A Life, an unflattering and possibly flawed portrayal of the historical novelist that turns on his mid-century decision to walk out on his first family. Here, Tolstoy tries to set the record straight by providing a more nuanced view of his stepfather's choices and eccentricities. Unfortunately, each moment of clarification is accompanied by a moment in which Tolstoy, routinely name-checking King's biography, falls into the role of an apologist. 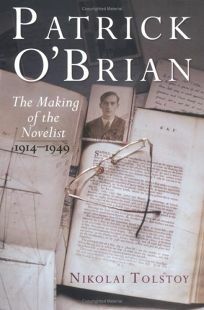 The tragedy is that O'Brian is a fascinating subject because of his faults, shortcomings and quirks, not in spite of them, as Tolstoy would seem to believe.